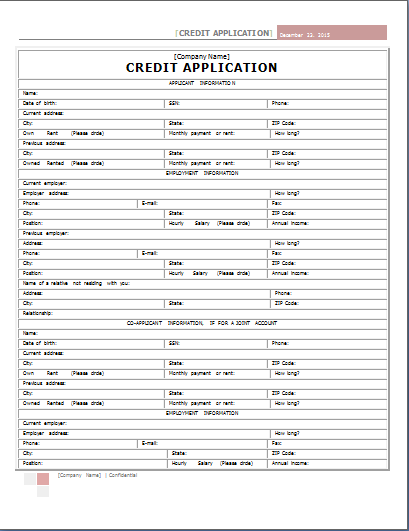 What is credit application form? Any individual or organization can undergo a financial crunch or shortage of money. At any time and any stage, they might be in need of finances more than what is available with them. In such situations, they have the option to borrow the required amount from a second party. This can be a Bank, any other financial institution or a person in general. The amount borrowed from a second party is called a loan or credit provision. The person taking the credit is the debtor while the one giving the loan is a creditor. When a creditor is extending a loan or taking the decision to give the loan he needs to assess certain parameters and guidelines. The credit application form is a formal request that is used by applicants to forward their requests to the potential creditors. These creditors whether the big or small need to evaluate the financial position and standing of the applicant to see whether he will be able to return the loan or not. This examination of the character of the borrowing party and his ability to run a successful money earning process is gauged by using a credit application form. The form will require the applicant to not only mention their personal details but also the reason for taking the loan, loan amount, repayment period and the interest rate they are willing to pay back to the creditor. Thus by filling in the credit application form, the applicant will be providing all the related information and data about the loan they seek from the creditor.